Everyday I get some questions about my life, fitness, health, beauty and so on by email, on Instagram and on Facebook. I always reply but because of lots of messages it takes some time, and not always people are very patient to get answers to their questions. Last night one of my very impatient follower contacted me by phone, I have no idea how that dude found my number but anyway after that I decided no matter the busy day it’s time to make this blog post up. Anyway, there are lots of similar questions from different people so I thought it’s much easier to collect them all here. From now I will make ‘FAQ posts’ here on my blog at times which why there is own category for FAQ. So when you want to know what people are asking me and my answers for the questions just hit the ‘FAQ’ category and choose the post you want to read. If there is something missing, let me know. 1. Why did you decided to lose weight? I never thought about losing weight because I was happy and felt good in my own body, but hard pushing and teasing from my grandpa made to do it. During the years I listened to him but after all I was too weak to hear those horrible words about me and my body anymore. After all years I found myself believing I was disgusting and ugly and this feeling didn’t fade away by weight loss, it was too deep inside of me. I had to met my grandpa often and I loved him a lot which why this all was very hard to me. Today I know the problem was in his own head, not in mine and I am OK with it and him. It took a long time to finally reach this peace and body balance I am having at the moment. This is also why I always courage overweight people to lose weight only for themselves, not for someone else, not for beauty just for health. Because of these reasons I fell in anorexia few years after weight loss. I also want to say I didn’t reach beauty by weight loss, about a year after anorexia recovery I started to look different. Sometime after hearing this people ask if I am feeling grateful for my grandpa after all? Not even a bit and I never will. I suffer a lot during years before starting to lose weight but even more after weight loss, I never was good enough. 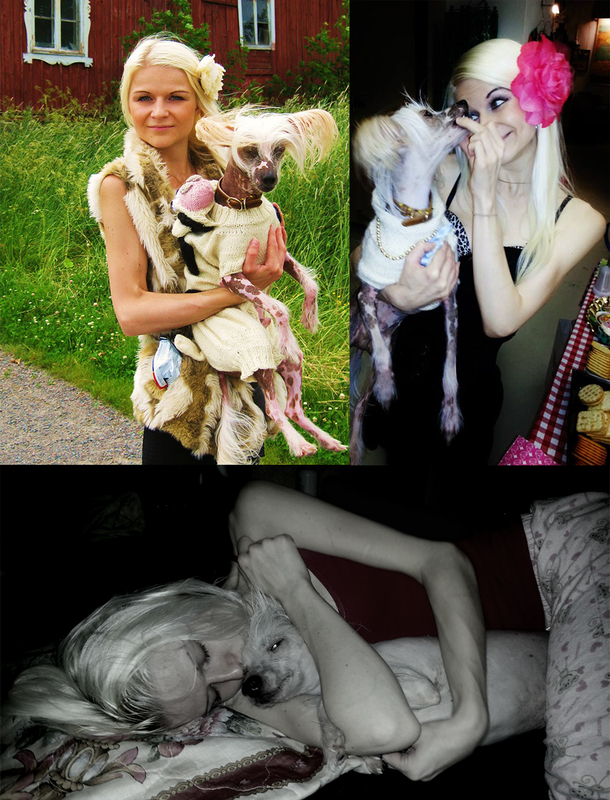 When I fell in anorexia my health was very bad, my grandpa visited at hospital to see me and I saw he felt very guilty. He never said anything but I felt his pain in me. It was too late to get anything on my mind fixed, I was too afraid of everything especially of food and by that of weight gain. So no, not even a bit I am feeling grateful for him. I love him and I have forgiven, but any respect of this I will never give. 2. Was the losing weight easy to you or did you have to start many times? No it was not easy to me because I was, and I still am, such a food lover. I used to pamper myself with brownies and cheese cake, creamy hot chocolate and bread with butter. I baked something sweet like pastries every week and every second day I baked some bread. It was very hard to me to change this! I can remember those nights when I had dream about pastries and woke up for the horrible desire of cheesecake with peaches and raspberries, and creamy blueberry pie. It was horrible. The nutrition has always been very interesting to me and I was learning of it so this was the thing that made the healthy dieting and weight loss to be easier to me. I was able to do it all on my own, I just had to find some motivation to do it. So in theory it was easy to me but in a real life it was not at all: I wanted to eat all the time and I really hated all kind of sports and sweating. 3. What was your weight when you were heaviest and what’s your weight now? I was a around 84-86KG (185-190LBS) when I started to lose weight, I dropped it to 54KG (119LBS) which was very nice weight to me and where I stayed years until I fell in anorexia. I am now 54KG (119LBS) as well. 4. How long it took for dropping first 10KG (22LBS) to you? So, when I finally really started my journey meaning I was planned a safe diet plan without starving and workout plan without anything I hate (Yoga was only one I didn’t hate! ), it was not so hard anymore. The first 10 kilos (22LBS) was actually the easiest part, it took about 4 months to do it by following healthy diet plan without starving and anything I hated. 5. What kind of diet you followed when you lost weight? The worse things were cravings and them feelings I wanted something but I was not allowed to get it. My own planned diet plan was very nice and it allowed me to have a dessert everyday and every Saturday I was allowed to eat what ever I wanted. The thing that boosted my motivation up was I myself: I was smart enough to speak myself the nice way, I was learned it was hard enough to have all negativity from my grandpa. I was smart enough to eat ENOUGH because I knew what eating too little and wrong kind of foods would make to my body during weight loss. I never tried any quick diets or meal replacements, studying nutrition very intensive way helped me a lot. So by following this kind of diet plan that was 1800-2000 calories depending on my activity, I hit my weight loss goal in 1,5 year. 6. Did you ever gained your weight back? Yes I did but not to the top. I gained to 62KG (136LBS) after first anorexia recovery and to 58KG (128LBS) after second recovery. 7. Did you do fitness a lot while weight loss journey? First 3 months I did yoga once in a week and two miles day walk twice in a week only. After this I started to be interesting in dancing, about one year later I found running to be nice to me. The gym and fitness I found years later in 2015. 8. Did you become to be a body positive person after weight loss? No, as I said I didn’t lose weight for myself so I never found the balance with my body. I actually became to be a body positive person last year which is so very far from all those times. 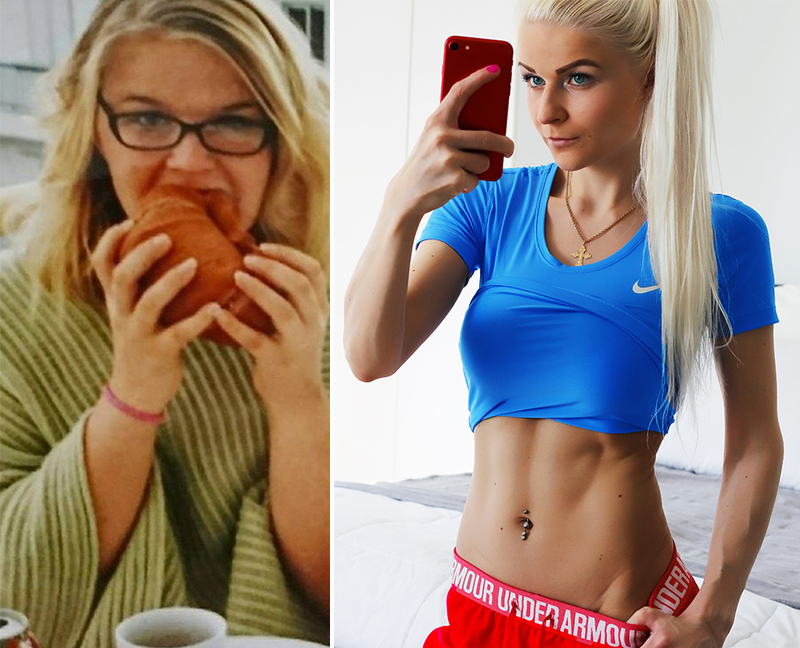 Once again: never lose weight for anyone else but yourself, not for beauty just for health. 9. Are you now happier than when you were overweight? Well.. I am happy but it’s nothing to do with weight or how do I look, it’s all about how do I feel. I can’t change the past but I can learn from it. I wish my weight loss journey was happier and that way more motivating one, but it is what it is. I still believe you can reach the happiness by weight loss when you do it for yourself, for your health. So many so often ask me if I am happier now, but if you really think about my story and watch my pics when I was chubby you can see how happy I was. This happiness was destroyed years ago and not the same feeling I will never get back with myself. I will never be the same way ‘free’ from all fears and all self-critics I was but I have learned to live with it. So I am not happier but I am different way very happy. I am not sad, I am not carrying any negative thoughts or things with me. There are all good in this life now but I have my scars. 10. Was The Barbie your body/weight loss goal? Oh, no! I actually never thought about Barbie’s body, her beauty and attitude only. I admired Barbie because of her character and talents, she is always nice to everyone even to haters, and her intelligence is very fascinating! 11. What was your breast size before weight loss? How about after? 12. What was your clothes size before and after weight loss. What is your size now? I was size 10-12 (40-42) before weight loss and after I was 2-4 (34). Now I am the same 2-4 (34). 1. Why did you fell in anorexia? As I said above I never found a balance with myself after weight loss because I never started to lose weight for myself. By losing weight I just tried finally to be accepted but I was never enough no matter how much I lost. Also when I moved to live on my own I had lots of stress which pushed me to workout and keep focus on eating on very controlling way. 2. When did you recover from eating disorder? Well, after first anorexia recovery I was very sure I will never fall in back there anymore. But I did and it was about 10 times worse than the first time I fell in eating disorder. From 54KG (119LBS) I went down to 35KG (77LBS) and I was not able to walk on my own anymore because I got fractures on my feet by walking. So there is actually no total recovery for my kind of person, there is only a balance you want to stay on and you’re everyday fighting for. There are lots of triggers all the time all around, by accepting this and your disease without shame it’s easier to live. Reaching the body positivity was huge thing to me but I still have to understand the fighting is not over, because the life is on. 3. Do you recognize the anorexia triggers in your own life? Yes I do, the stress is worse. 4. Are you ashamed of your past as an anorectic? I was and mostly because all eating disorders are very much about mental illness. I never wanted anyone to know about my eating disorder and I denied it for a long time. The recovery started by accepting the truth. I am ashamed of it today? No, I am just very grateful for the strength I had to I fought back, I am happy for life. 5. Why did you fell in anorexia again after first recovery? I had VERY hard times and I had an other health issues at same time, so horrible stress triggered the eating disorder. It started slowly as usually and I was too tired to recognize it, I was also too exhausted to accept this horrible disease was reaching me again. In a nutshell I was too weak to fight back. 6. What kind of help you got for the second recovery? I didn’t get any help because there was no one who could understand me. All kind of therapies made me feel worse which why I went very down with myself. There was few times I was delivered to the hospital by ambulance because of fainting and too low pulse, but all the time I denied the hospitalization. I felt there was more sick people than me who needed help and I had no one to take care of my dog while staying at hospital. This was one and only thing I tried to recover for so hard: my dog needed me. I had no other reason to stay alive but my little Bean, so actually all help I got came from him. I spent every moment with him and pampered him all way I could, he boosted my hope to survive. My Bean was small, only 5KG (11LBS) but look how huge he looked next to me at this time. 7. I read you were near to suicide before the second eating disorder recovery. What did save you from this? I am also curious to know how do you feel about it today? There is a reason I carry the cross on my chest and cyrillic tattoo on my back. I am not talking about of this dark time of my life on media a lot because it was very hard time to me. I have lost people for suicide and I can say I really do understand the feeling, which is not actually even a feeling anymore, when you just want to fade away. I have been there and all I can say I will never want to get back there anymore. I am feeling very grateful for life and I have my desire to help people with their problems. 8. Did you ever use drugs? I hate drugs and I have never used or tried any. 9. Do you feel being special after so many hard issues you have went through? No I don’t, I am not more special than anyone else is. I believe we humans are all same, we have the same structure meaning brains, cells, blood, breathing system, muscles, bones and so on.. But not everyone uses and trains their brains us much as someones which makes a huge difference between people. I am not more special but I have my strength and intelligence. I know we humans can do anything, we just have to want it and work for it very hard. 10. What kind of diet you was on during recovery? During my first recovery I was hospitalized no matter the first time I fell in anorexia was not that bad than the second one. So during first recovery I was on hospital diet. When I recovered on my own II started +200 calories per day for first month, no exercising at all. Next 3 months I was +300 calories per day, if I wanted to exercise I made myself to eat at least as much I was burned. It was very hard to eat this much which why I ate 7-10 times in a day. I kept focus on nutrition meaning carbs, fats, proteins and all vitamins no matter I was very scared of fats and carbs. The second recovery was super hard but by thinking the food was a medicine, the only one for this disease, helped me to went through it. 11. Was it hard to allow the weight gain? When you do your weight gain journey healthy way the same way than healthy, slowly weight loss process meaning keeping focus healthy, clean eating and eating enough the results you get will be nice and long lasting. It’s never good to lose or gain weight fast, it’s a huge shock to your body and your mind as well. But yes, the process is always very hard and weight gain is super hard to allow. It helped I didn’t had scale but it also asked a lot of bravery to step to the scale first time one year later. One year is a good time to me because healthy weight gain changes your mind to think healthier as well, but the change happens very slowly. 2. What kind of diet are you on at the moment? I am following hunger, I let my body tells how much it needs but only clean foods meaning no toxic like white sugar. 3. How much do you exercise in a day? In a day, really? I don’t exercise every day, 3-4 times in a week I do a workout. 4. What kind of facial surgeries have you done? Or botox or fillers? Oh really? I haven’t done anything for my face. I have no idols instead people I respect a lot. Those people are Warren Buffett and Bill Gates because of business and charity. I also appreciate Angelina Jolie because of charity and adoption, she has also went through very hard times so I feel there is something in common with us. 6. How often do you weigh yourself? I don’t weigh myself often anymore, the best measuring is clothes. As long as same clothes fits on me I don’t have to be worried and step on scale, I weight myself about once in every second month. Pink, definitely pink! Other colors I love are white, yellow and turquoise. 8. I have seen you love Star Wars, what else you like? I love Marvel a lot, my favorites are Spiderman, Daredevil, Punisher, Luke Cage and so on. I also love James Bond and Batman. Guillermo Del Toro’s style is very fascinating, same way I love M. Night Shyamalan. 9. Why your dog has no teeth? He looks cute when tongue is out but I am wondering how can he eat? Awww, thank you. BenBen is a rescue baby and he has lost his teeth because of bad past life. I prepare his food myself, all foods have to me mashed so eating is very easy to him. 10. I love you hair, don’t you really have extensions? Thank you. And no I don’t have extensions, I use CocoaLocks only. 11. Do you go USA often? When you come to LA? I love USA but not travel there so often anymore. I have never been in LA but I would love to! 12. Which body part you most love in yourself? 13. How often you do ab workout? I don’t have day for abs only, I do same after all workout meaning 3-4 times in a week. 14. I have the same bum you had before so you give me a lot motivation. How long it has taken to grow your bum and how often you do leg workouts? I tried to build my bum for two years but no matter I had a lots leg days I didn’t get results. When I started to eat more carbs and fats my bum and legs started to grow and actually pretty quickly. The pig below is my 6 months transformation. 15. Do you use supplements? Yes I am. In this kind of world today there are so much evil around all the time. 17. Where do you buy your clothes? I am pretty boring person haha, I don’t like shopping at all. I always shop online and my favorite brands are Ralph Lauren, Tommy Hilfiger, Versace and Victoria’s Secret. 18. What’s you’r favorite food by the way? I love food so much! My favorite is broccoli, steak and oatmeal. 19. What’s your travel goal? I would love to go Maldives someday, it’s my dream. But totally goal is Disney world! 20. Where do you buy your underwear? I love so much those ones with coral shades and glitter! Those you mean are from Victoria’s Secret, I mostly love this brand on underwear. I also use Tommy Hilfiger and Calvin Klein. Lola, You have a beautiful heart and soul! So wonderful that you can share your journey, especially the painful part with others. I wish you to always be healthy mind and body. I understand your struggles, I too have felt “not good enough” for some important people in my life, recognizing the problem is theirs and not yours is the key to succeed in your journey. It’s difficult to forgive sometimes, especially without apologies from the offender. I am proud of you and wish you all the best dearest Facebook friend! When you’re ready for another adorable hairless Crested, I know someone in the US who breeds some of the finest Cresteds in the world, he breeds only for the love of the dogs, he will get you a healthy dog, just let me know, I will be happy to assist you.